Walk-In Clinic: 8a-8p M-F, 9a-4:30p Sa, 12p-5p Su. All other clinics by Appt. St. Rose Health Center serves a population of 60,000. 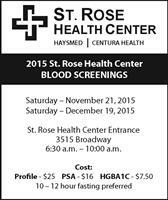 St. Rose Health Center is located in Great Bend. St. Rose Health Centers state-of-the-art technologies include urgent care clinic, same-day surgery, physician clinics, imaging (x-ray), laboratory services, home health and hospice and employer based occupational medicine services. Affiliated with HaysMed and Centura Health, St. Rose Health Center is committed to serving the health care needs of our communities. St. Rose Health Center will continue to offer charity care and financial assistance to those patients who qualify. This assistance will be available for those outpatient services we provide.